The statue, sculpted by Richard Berger in 1984, is the centerpiece of a downtown park at 7th Street between Broadway and Hwy 36. Murals depict scenes from local history. 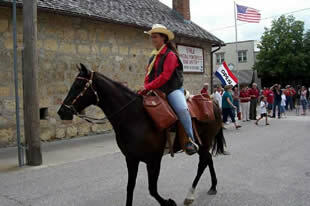 One is a Pony Express rider, modeled by local Re-rider Dan Koch. When the viewer walks in front of the mural, the horse and rider appear to move.